There are a couple of key features that make a turtle a turtle: its shell, for one, but also its toothless beak. A newly-discovered fossil turtle that lived 228 million years ago is shedding light on how modern turtles developed these traits. It had a beak, but while its body was Frisbee-shaped, its wide ribs hadn't grown to form a shell like we see in turtles today. "This creature was over six feet long, it had a strange disc-like body and a long tail, and the anterior part of its jaws developed into this strange beak," says Olivier Rieppel, a paleontologist at Chicago's Field Museum and one of the authors of a new paper in Nature. "It probably lived in shallow water and dug in the mud for food." The new species has been christened Eorhynchochelys sinensis–a mouthful, but with a straightforward meaning. 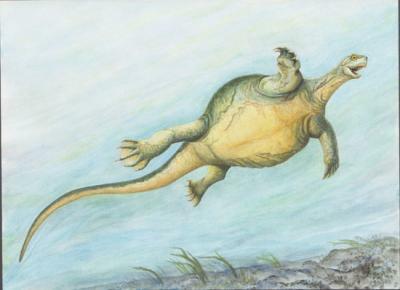 Eorhynchochelys ("Ay-oh-rink-oh-keel-is") means "dawn beak turtle"–essentially, first turtle with a beak–while sinensis, meaning "from China," refers to the place where it was found by the study's lead author, Li Chun of China's Institute of Vertebrate Paleontology and Paleoanthropology. Eorhynchochelys isn't the only kind of early turtle that scientists have discovered–there is another early turtle with a partial shell but no beak. Until now, it's been unclear how they all fit into the reptile family tree. "The origin of turtles has been an unsolved problem in paleontology for many decades," says Rieppel. "Now with Eorhynchochelys, how turtles evolved has become a lot clearer." The fact that Eorhynchochelys developed a beak before other early turtles but didn't have a shell is evidence of mosaic evolution–the idea that traits can evolve independently from each other and at a different rate, and that not every ancestral species has the same combination of these traits. Modern turtles have both shells and beaks, but the path evolution took to get there wasn't a straight line. Instead, some turtle relatives got partial shells while others got beaks, and eventually, the genetic mutations that create these traits occurred in the same animal. Fine details in the skull of Eorhynchochelys solved another turtle evolution mystery. For years, scientists weren't sure if turtle ancestors were part of the same reptile group as modern lizards and snakes–diapsids, which early in their evolution had two holes on the sides of their skulls–or if they were anapsids that lack these openings. Eorhynchochelys's skull shows signs that it was a diapsid. "With Eorhynchochelys's diapsid skull, we know that turtles are not related to the early anapsid reptiles, but are instead related to evolutionarily more advanced diapsid reptiles. This is cemented, the debate is over," says Rieppel. The study's authors say that their findings, both about how and when turtles developed shells and their status as diapsids, will change how scientists think about this branch of animals. "I was surprised myself," says Rieppel. "Eorhynchochelys makes the turtle family tree make sense. Until I saw this fossil, I didn't buy some of its relatives as turtles. Now, I do." This study was contributed to by Institute of Vertebrate Paleontology and Paleoanthropology, the CAS Center for Excellence in Life and Paleoenvironment, National Museums Scotland, the Field Museum, and the Canadian Museum of Nature.